U.S. Markets continue to try and find stable ground to stand on in 2015 but are down over 1% as of the time of this writing. 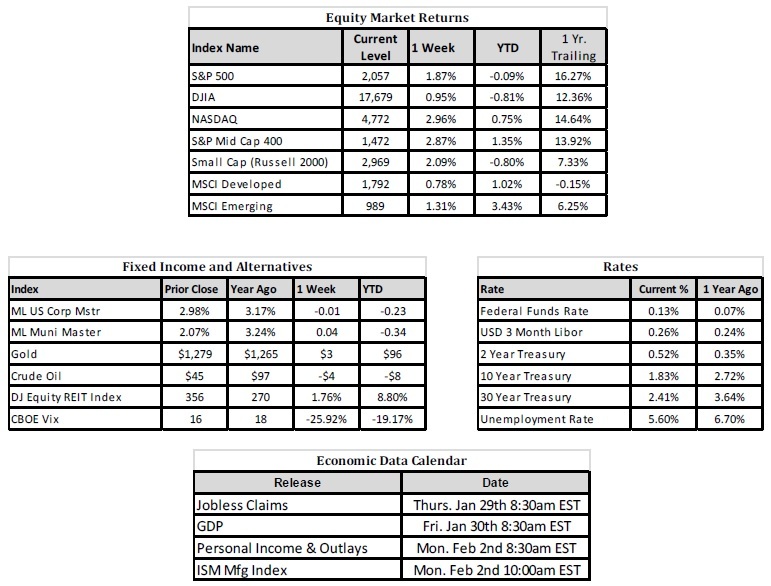 In terms of individual sector performance, defensive sectors such as Utilities (+4.15%) and Healthcare (+4.62%) have posted strong returns as investors look to take advantage of the relative strength of the U.S. economy through historically less volatile areas of the market. REITs (+8.19%) continue to prove attractive as rates on most fixed income securities remain low and a more cautious approach is taken with regards to investments in energy related, high yielding MLP securities that have been a source of income for yield starved investors in this low interest rate environment. Of the 18 trading days since the start of 2015, the S&P 500 index has posted negative returns over 60% of the time and has seen a positive daily gain only 7 times. Interestingly, however, is that on the 5 days when the market has moved by more than 1%, it posted gains 80% of the time! This is a result of the market finding more conviction to the upside when uncertainties are addressed. For example, perhaps the biggest uncertainty entering 2015 was the steep fall in the price of oil and where it was headed. When oil stabilized around $50 a barrel on January 7 and January 8, the market posted its largest two day advance of the year gaining a cumulative 2.98%. Further, on January 16, a day after the market absorbed the surprising news of the Swiss removing their currency peg to the Euro, the S&P 500 index advanced 1.34%. Yet another uncertainty this month has been what action the European Central Bank would take with regards to their asset purchase program. Last Thursday, January 22, when Mario Draghi announced the ECB will be purchasing €60 billion of sovereign debt a month until the end of September 2016, the U.S. market increased 1.53%. The return of volatility to the stock market has not caught us off guard and we continue to manage client accounts with a focus on diversification and reducing the overall volatility associated with our target-risk portfolio strategies. We do caution investors, however, that if they find themselves overly concentrated in U.S. stocks, as a result of the strong market performance since 2009, they should consider taking steps to re-allocate and diversify accordingly. Recognizing that this can be a difficult and time consuming task, we, at Hennion and Walsh Asset Management, suggest the use of a professional portfolio manager. If you have any questions, or would like to speak with a member of our Asset Management Team, please contact your Hennion and Walsh Financial Advisor and schedule a free consultation.